Kyle McCallan on show for Waringstown during Saturday's Irish Cup victory against St Johnston. Waringstown finally got their season up and running on Saturday, beating St Johnston by 10 wickets in the first round of the Irish Cup. The villagers had seen their first two matches of the season washed out by rain, so there was relief that they finally got out onto the pitch. Their rustiness showed at times during the field against St Johnston, with the North West side showing commendable fighting qualities after being put into bat on a pitch with more than a tinge of green. Ruhan Pretorious and Phil Eaglestone, the new-ball pair, probably didn’t make the visitors play enough early on and it was left to third seamer James McCollum to finally break through in the game’s 14th over. St Johnston were dismissed for just 64 in their opening league match against Bready and when Kyle McCallan struck twice in his first over to reduce the visitors to 44 for three, they may have feared the worst. Kevin Martin, the player-coach who joined from North West champions Strabane over the winter, dropped anchor thereafter and ensured there was no repeat. It was a policy never likely to give them a chance of winning the match - he made an unbeaten 28 from 89 balls - but the left-hander shepherded the middle and lower order and helped St Johnston towards what looked like a total of around 140. 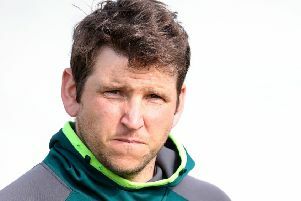 Any misgivings about the pitch were soon dispelled by Waringstown’s openers, James Hall and McCollum and before long Hall in particular was batting with a typical flourish. He whipped one maximum off his legs and over mid-wicket before a trademark straight six flew over the sight-screens. McCollum brought up the century stand with a sweetly-struck four over the top. The win was wrapped by the 16th over. Waringstown take on either Derriaghy or Academy in the first round of the Challenge Cup on Saturday. The seconds won their first match of the season, beating Muckamore by 121 runs on Sunday. Andrew Mitchell top scored with 82, Morgan Topping made 45 and Marcus McClean 37. The best bowlers were Jack Carson with 3-14 and Topping with 2-24. The thirds also won comfortably on Saturday, beating Laurelvale by 120 runs. Jamie Matthews hit 69 and Keith Morrison 58 in a total of 225 for five in 30 overs. Laurelvale never got close in reply. Thanks go to match sponsor Derek Healy for his continued support.